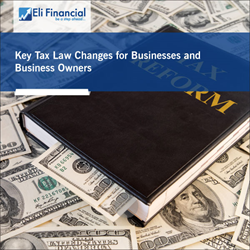 This live webinar by Eli Financial will provide a clear outline of major federal tax law changes, including tax rate changes, the “pass-through” deduction, modifications to rules regarding deduction of certain expenses, and future trends. The 2017 Tax Act is complex, full of opportunities and traps for the unwary. Another round of tax reform may be coming, but it is important to plan in the interim. Eli Financial, a division of audio conference and corporate education leader ProEdTech, will host the live webinar “Key Tax Law Changes for Businesses and Business Owners” with industry veterans David G. Shapiro and Fatima Hasan on Wednesday, July 11, 2018 at 1:00 PM ET. The 2017 Tax Act is complex, and full of opportunities and traps for the unwary. Another round of tax reform may be coming, but it is important to plan in the interim. The tax law has significantly altered the tax landscape for businesses and their owners – but the Treasury Department and the IRS have provided limited guidance so far. Therefore, one needs to fully understand what can and can’t be done under the new rules – and should not miss out on the narrow window of opportunity to take advantage of the new rules before they expire or are scaled back. The law lowered the corporate tax rate to 21% and made many other significant changes to taxation of individuals and businesses – including a new 20% deduction for certain qualified “pass-through” income – and modifications to both business and individual tax deductions. But how to take advantage of these changes? In this webinar, industry veterans David G. Shapiro and Fatima Hasan will demystify the key tax law changes impacting businesses and their owners. They will reveal the planning techniques through which one can take advantage of new tax deductions and lowered rates, point out the traps that the clients should avoid – including the known unknowns – and walk attendees through how the complex new provisions interact with state taxation. The speakers will present concrete numerical examples to help understand tax differences under different scenarios. They will teach how to develop tax-efficient structures for different types of businesses and business owners, taking into account both current tax planning and planning for business sale or succession. After attending this instructive session, attendees will be able to review, modify or create new tax-efficient business structures, find new tax saving opportunities through tax accounting changes, and plan new deduction limitations for their company and clients. Get $30 off on our webinars. Use Code PRWEB30 on checkout. ProEdTech’s Eli Financial platform offers tax and banking professionals, focusing on providing high-quality online training products customized for U.S. lenders and tax practitioners that include the latest updates from the IRS, CFPB and other regulatory authorities. ProEdTech’s webinars are also offered through AudioSolutionz in the technology, human resources, construction and housing, ICT and telecom, manufacturing, consumer packaged goods and retail, safety and security, transportation, energy and environment, education, trade, and chemicals industries. ProEdTech’s AudioEducator webinars offer updates, regulatory knowledge and information on the latest news in various medical specialties, as well as coding and billing updates, and analysis of regulations that affect ambulatory surgical centers, home health, long term care and hospice facilities, hospitals and healthcare systems, health insurers and physician practices. ProEdTech regularly provides professionals the opportunity to get answers to their most complex questions directly from experts, without having to attend costly live conferences. To learn more, visit: http://www.proedtech.com/.